My Mom is the ultimate superhero. She has lived with Multiple Sclerosis for the last 20 years and despite the fact that she hasn’t been able to walk for about 15 years she has never let it slow her down. Her strength in the midst of adversity is a super power I hope that I can have throughout my life too. 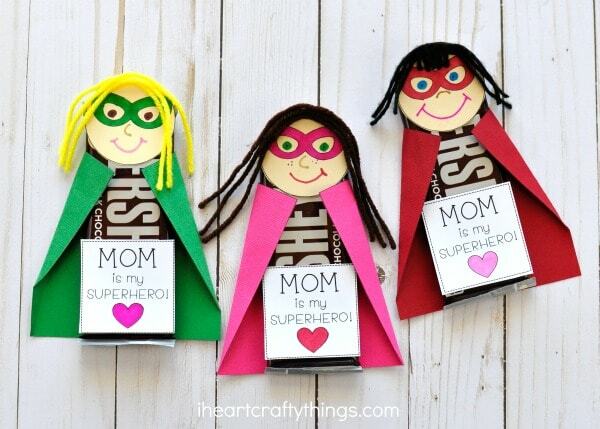 Celebrate your superhero Mom this year with this DIY Superhero Mother’s Day Gift. 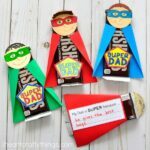 Kids will love customizing their superhero to look just like their Mom and will win over their Mom’s heart not only because it’s darling but hello…chocolate!…The way to any woman’s heart! 1. Begin by downloading the superhero template. The template is made with several different faces and gift tags on each page to accommodate a classroom if needed and to conserve paper. Print the faces on a skin color cardstock of your choice, print the gift tags on white cardstock and print the the superhero capes on any color of cardstock. 2. Cut out a superhero face, tag and cape. Use your markers to color in the features on the superhero face like eyes, nose and a mouth. Then color in the heart on the gift tag. 3. Cut three strands of yarn for the hair. Glue them down at the top of your superhero with tacky glue. You might also like to add bangs if your Mom has them. 4. Place the candy bar in the center of the superhero cape with the bottom of the candy bar at the bottom of the cape. Fold the top two corners inward and make a crease to create your cape. Remove the candy bar, add two pieces of tape in the center of the cape and stick your candy bar in place. Add a piece of tape on each corner of the folded cape and stick them down onto the candy bar. 5. Add a piece of tape at the bottom of the candy bar and place your gift tag on it. 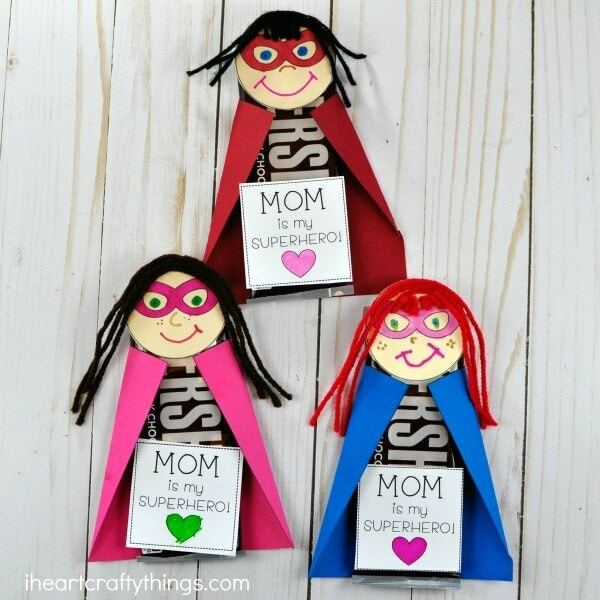 Finish your DIY superhero Mother’s Day gift by taping the face at the top of the candy bar. 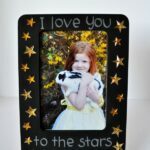 Looking for more DIY Mother’s Day gifts? 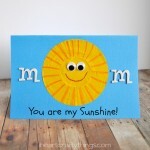 Check out this simple kid-made Mother’s Day card or here’s an awesome popsicle gift for Mom. Hi Sherrie! Scroll down the post until you see a list of “Supplies” you’ll need for the crafts. The templates are linked within that supplies list and also in step #1 of both of the crafts. If you have any more trouble, let me know, and I can email them to you. Thanks! These are super-adorable! Great ideas for mother’s day. The questionnaire could not be completed as the question would jump forward when answering. 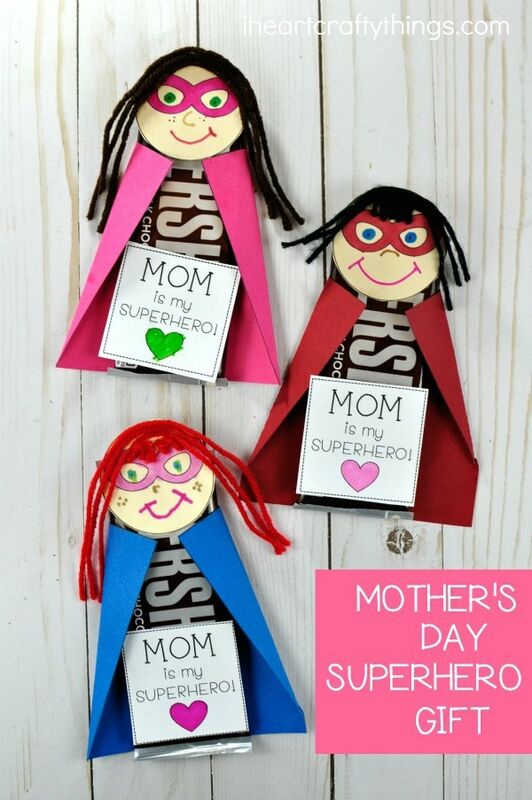 What size candy bars are used in the Mother’s Day Superhero gifts? The candy bars were just a single size Hershey’s bar. I bought the package of 6 at my local grocery store. I think you could make the template work with a variety of different candy bar sizes though. I love these ideas and they are easy for kids. So cool! My mom is my superhero!